When it comes to self storage, a lot of companies offer nothing else than a place to stick your stuff. Uncle Bob’s self storage has taken a unique and more comprehensive approach to packing, moving, and storing your belongings while still holding on to what makes self storage so useful. If you haven’t heard of them before, then it might be worth your time to take a look. Here is a quick Uncle Bob’s review to help you decide whether or not they are offering a service that would interest you. Uncle Bob’s self storage is owned by Sovran Self Storage Inc, which has been around since 1982. They own and operate more than 350 facilities that total more then 20 million square feet of space. This makes them one of the largest self storage companies in the country. Currently, they have units in 24 states, however they are continually expanding. One thing that makes Uncle Bob’s consistently stand out is the specials that they offer new customers. One of their recent specials was “get this month free and next month name your price”. Other specially include 50% off for 1 year and even a free truck rental to help with the move-in. Uncle Bob’s has a huge selection of storage unit sizes. They range from 5 feet by 5 feet to 20 feet by 20 feet. In total, they have 8 rental unit sizes, not including units designated for automobile storage (car, truck, motorcycle, tailors, RV, and boat). The spaces for vehicles range from completely indoors to open, outdoor spaces. Uncle Bob’s self storage not only offers units, but also a wide range of tools and products to help you move in and out. Along with your normal moving boxes, they also have wrapping paper, protection kits, bubble wrap, locks, packing tape and much more. They even have their own moving trucks that you can use. Overall, there does not seem to be a lot of drawbacks to Uncle Bob’s self storage. They tend to get very positive customer reviews. If there is any drawback it would probably be that there may not be one in your area. While they are one of the largest self storage companies in the country, they are still only in 24 states. 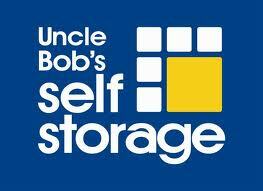 When comparing Uncle Bob’s to other self storage options, there are few things that stand out. One of the biggest differences is that they offer a huge range of services that simply can’t be found at most other companies. This includes everything from moving tools and moving trucks to the wide variety of storage unit sizes. Their unique specials are also an advantage because at least one special is going on at all times. There is a reason that Uncle Bob’s storage is one of the largest self storage companies in the county and it is that they have found a way to raise the bar in this industry. Read more self storage company reviews.